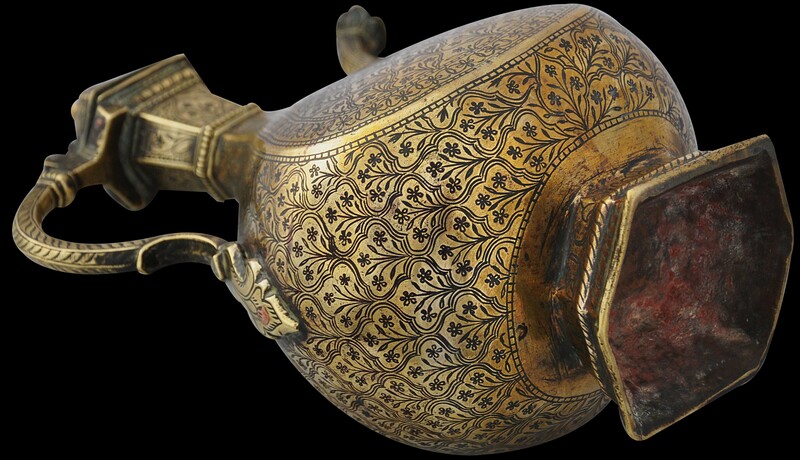 This magnificent Mughal brass ewer (aftaba) is of impressive size and refined proportions. It is in excellent condition for its age, has a warm, honeyed patina and somewhat unusually for a North Indian ewer of this type and age, retains its original hinged lid. It stands on a flared, hexagonal foot which rises to a tear-shaped body with rounded contours and tapering sides. The neck flares slightly to the opening on which sits the original, architectural-form lid that is surmounted by a bud-like finial. The handle is of ‘S’ shaped form. The spout of tapering pentagonal form also has a gentle ‘S’ shape which leads to a floral-form head. The base of hammered brass sheet is original and is folded and hammered over the foot to keep it secure. The body is engraved on all sides with interlocking architectural cartouches decorated with stylised poppy motifs. The engraving is highlighted with dark lac. Raised mouldings on the foot, handle and neck are incised with a repeated chevron design. The neck is composed of six, tapering panels, each engraved with a framed panel of a single flowering plant. A light join around the lower half of the body provides clues as to the construction: the ewer was cast in several parts which were then joined. 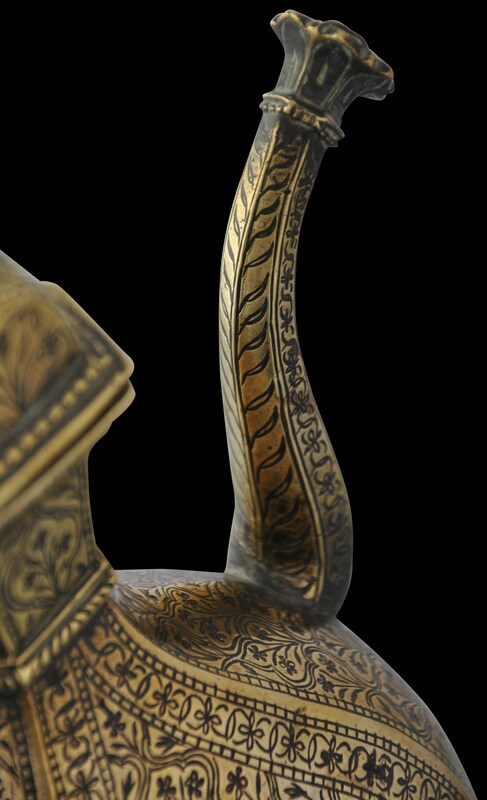 The form, with its tear-shaped body with tapering sides and to an extent the extensive floral decoration, relates to a well-known bidri ewer in London’s Victoria & Albert Museum, illustrated in Stronge (1985, p. 40) and Zebrowski (1997, p. 162) and which is ascribed to the mid-17th century. (The form of this type of ewer appears in dateable Indian miniature paintings from the mid-seventeenth century.) The V&A example is without a lid. Two related brass ewers are illustrated in Zebrowski (p. 40). Neither of these retains its lid. 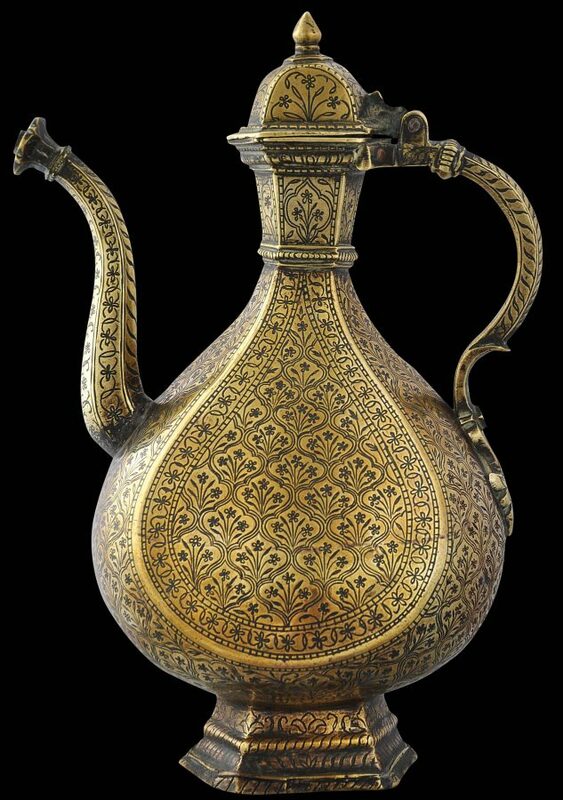 Typical Islamic ewers comprised a central chamber to which a spout, foot, handle and neck were attached. They permitted water to flow – Koranic injunctions deemed flowing water to be ‘clean’. 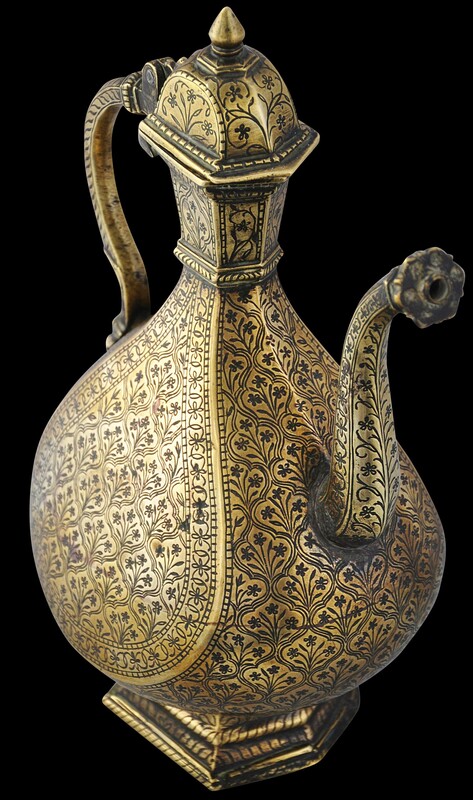 Ewers were introduced to India by Muslim invaders during the late thirteenth and early fourteenth centuries. Thereafter their designs were Indianised – the ewers became more curvaceous and were decorated with lush plant and floral motifs. In India, local Muslims used such vessels for handwashing. They became a practical tool of hospitality, being used to welcome visitors by pouring scented water over the hands and feet and into a basin. In this way, the motifs employed on such vessels in Northern India can be seen as particularly appropriate: the scrolling arabesques and trellised cartouches of floral sprays can be seen as representative of a paradisical garden, a destination of pleasure and balm – the orderly, repeated pattern of floral cartouches can be seen as representing the ordered layout of the idealised Islamic garden (Thomas, 2011). 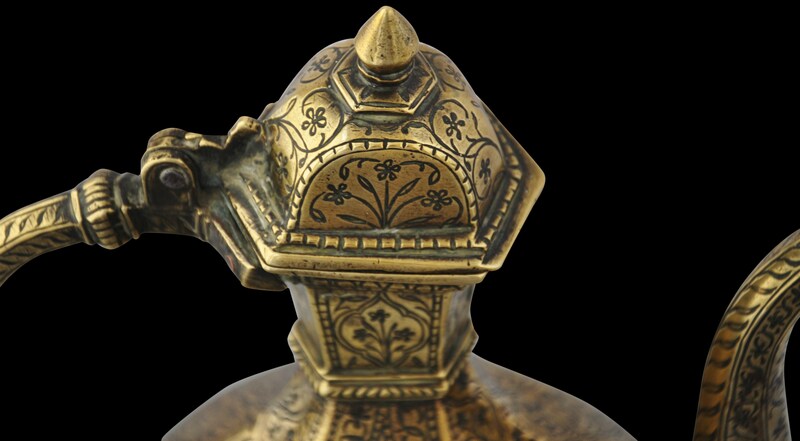 North Indian ewers of this quality have become increasingly scarce and are much sought after. 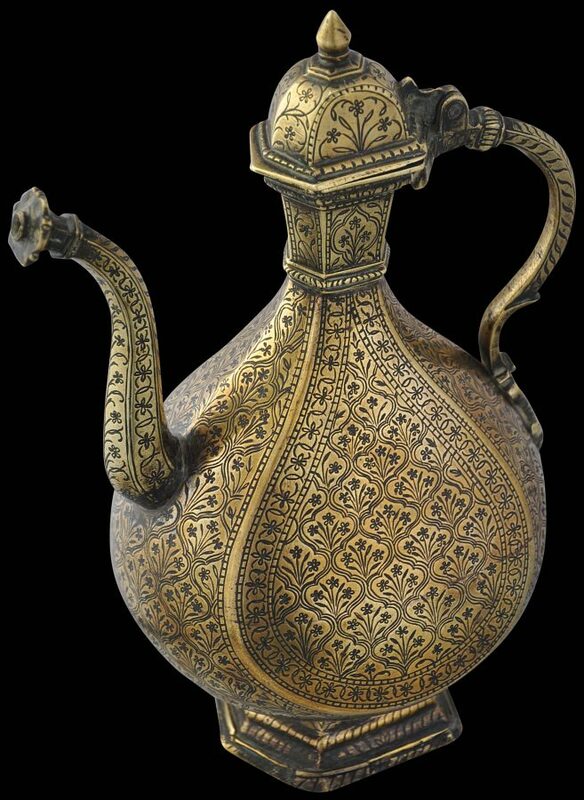 This was particularly evidenced by the prices achieved for better quality Mughal ewers in the Christie’s and Sotheby’s sales of the collections of Stuart Carey Welch and Simon Digby in London in April 2011. This example is an especially fine example, with marvellous form and presence. Dye, J.M.,The Arts of India: Virginia Museum of Fine Arts, Philip Wilson Publishers, 2001. Stronge, S.,Bidri Ware: Inlaid Metalwork from India, Victoria & Albert Museum, 1985. 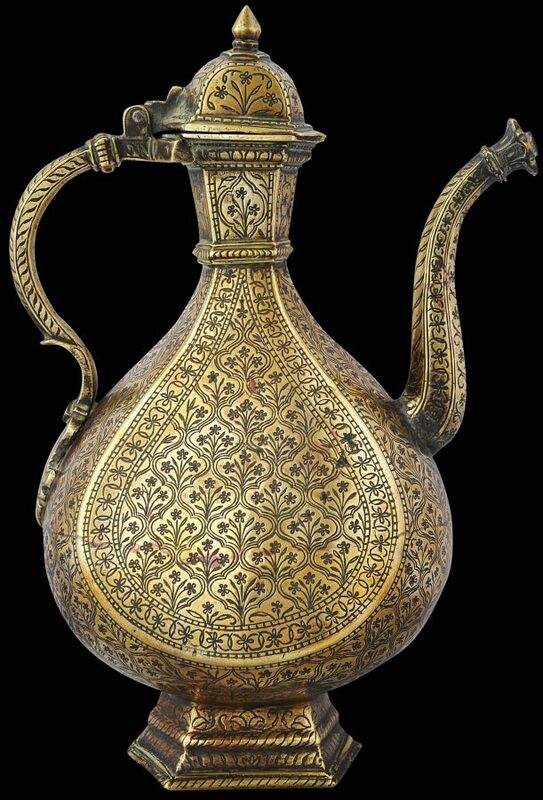 Thomas, D.,’The carnation ewer – an example of Ottoman influence on North Indian ewers’, unpublished paper, 2011. Zebrowski, M.,Gold, Silver & Bronze from Mughal India, Alexandria Press, 1997.